We present recent developments in the field of austenitic steels with up to 18% reduced mass density. The alloys are based on the Fe-Mn-Al-C system. Here, two steel types are addressed. The first one is a class of low-density TWIP or SIMPLEX steels with 25-30 wt.% Mn and <4-5 wt.% Al or even <8.wt% Al when naturally aged. The second one is a class of κ-carbide strengthened austenitic steels with even higher Al content. Here, κ-carbides form either at 500-600°C or even during quenching for >10 wt% Al. Three topics are addressed in more detail, namely, the combinatorial bulk high-throughput design of a wide range of corresponding alloy variants; the development of microstructure-property relations for such steels; and their susceptibility to hydrogen embrittlement. Reducing energy consumption in conjunction with improving safety standards is a paramount target in modern mobility concepts. Hence, the development of strong, tough and ductile steels for automotive applications is an essential topic in steel research [1-15]. In this context TWIP (twinning induced plasticity) steels with up to 30 wt.% Mn and >0.4 wt.% C content have shown an excellent combination of ductility and strength [16-34]. Increasingly, the reduction in mass density of high-Mn steels becomes an additional challenge. Two effects enable such efforts. The first one is that Mn increases the fcc lattice parameter. The second one is that very high Mn and C alloying stabilizes the austenite, so that it can tolerate Al additions up to about 10 wt.% without becoming instable, i.e. transforming into bcc-ferrite . Such an alloy concept sustains some advantages associated with TWIP steels, e.g. mechanical twinning and very high strain hardening [16,19,24]; yet, it enables density reductions of up to 18%, Fig. 1. Hence, alloys based on the quartenary system Fe-Mn-Al-C are specifically promising for the design of low density TWIP steels [37-47]. Regarding the excellent mechanical properties of TWIP steels, which are characterized by the transition from dislocation and cell hardening to massive mechanical twinning, it has to be considered that Al increases the stacking fault energy (SFE) [17,18]. This means that the overall strain hardening behavior and the onset of mechanical twinning in density reduced TWIP grades  may differ from those observed in conventional TWIP steels [17,19,24]. However, alloys based on the Fe-Mn-Al-C system offer an even larger variety in deformation and strain hardening mechanisms than those associated with the TWIP effect alone. This is due to the characteristic dislocation substructures and the higher number of phases present in the Fe-Mn-Al-C system, namely, fcc-austenite, bcc-ferrite, and ordered structures such as DO3 and L’12-type carbides. Depending on composition, low density steels can assume austenitic structure for the composition regime Mn: 15-30 wt.%, Al: 2-12 wt.%, and C: 0.5-1.2 wt.%. In order to combine the advantages of the TWIP mechanisms with the reduction in specific weight this alloy range is hence the most promising one. When increasing Al content to a range >6-8.wt%, strain hardening in these steels is less dominated by the TWIP effect but instead by the formation of nano-sized L’12-type carbides, so-called κ-carbides [44,45,48]. Density reduced steels with ferritic structure have compositions in the range Mn <8 wt.%, Al: 5-8 wt.%, and C <0.3 wt.%. Corresponding complex grades, consisting of austenite and ferrite can be synthesized by using compositions Mn: 5-30 wt.%, Al: 3-10 wt.%, and C: 0.1-0.7 wt.% . Besides these compositions, ordered D03 structures, i.e. near-ferritic Fe-Al-Cr alloys without Mn have also been addressed in the past in the context of density reduced alloy design. 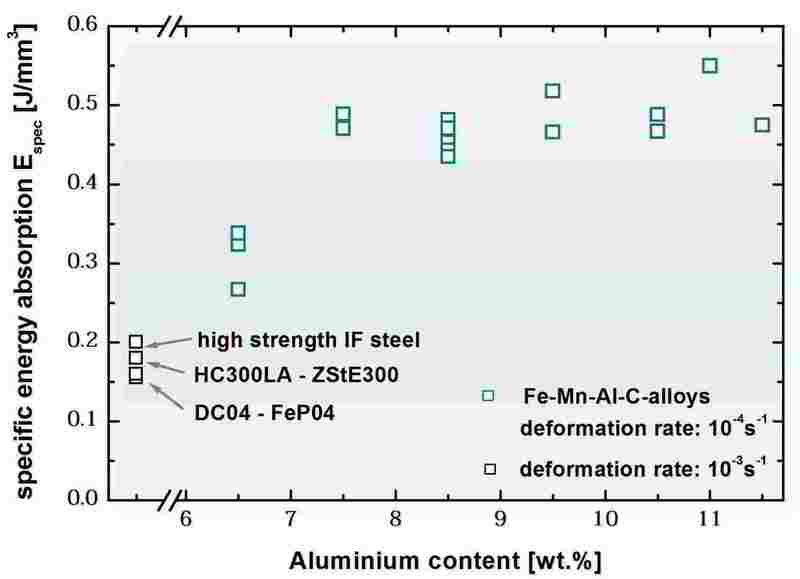 When comparing the synthesis and properties among the different classes of weight reduced steels, alloys based on the austenitic Fe-Mn-Al-C system are most attractive due to their superior strain hardening, high energy absorption (Fig. 2), high density reduction and robust response to minor changes in composition and processing [37-47]. Even thin strip casting with associated in-line hot rolling has been successfully conducted in our group as a pathway for efficient small-scale manufacturing of such grades. Recent publications on austenitic Fe-Mn-Al-C alloys have reported yield strength values of 0.5-1.0 GPa, elongations to fracture in the range 30–80%, and ultimate tensile strength in the range of 1.0–1.5 GPa [37-47]. When blended with an Al content below 5 wt.% a single austenite phase prevails at room temperature, showing excellent strain hardening which was attributed to the hierarchical evolution of the deformation substructure . Al also promotes formation of nano-precipitates upon aging with L’12 structure and approximate stochiometry of (Fe, Mn)3AlC [44,45,48]. These phases are referred to as κ-carbides. They belong to the group of non-oxide perovskites. Due to their ordered fcc structure, κ-carbides have a lattice mismatch below 3% with respect to an austenitic Fe-Mn-C matrix phase and can hence form cuboidal nano-precipitates [44,48]. When embedded in a ferritic matrix the lattice mismatch can be as large as ~6% [45,48] which leads to semi-coherent interfaces and, hence, different precipitate morphologies. This paper provides a concise introduction to some recent developments in the field of low density Fe-Mn-Al-C high-Mn steels placing attention on alloy design, synthesis routes, and microstructure-property relations. We also provide a brief outlook on pending questions associated with the role of κ-carbides on strain hardening and hydrogen embrittlement. Here we use a combinatorial approach for rapid trend screening and alloy maturation of metallurgically melted and processed Fe-Mn-Al-C low density TWIP and κ-carbide hardened steels. The approach is referred to as Rapid Alloy Prototyping (RAP) . We apply it here to one group of Fe–30Mn–1.2C–xAl (wt.%) TWIP steels and to a second group of Fe–20Mn–0.4C–xAl TWIP steels, both with varying Al content (x) and different aging conditions. In both cases, the samples were synthesized by melting and casting in a vacuum induction melting (VIM) furnace under 400 mbar Ar pressure. The system was modified to enable synthesis of 5 different alloys in one operation for each alloy system. We used 5 Cu moulds which could be moved stepwise inside the furnace. They were successively filled with melt from a 4kg ingot. After each cast, the remaining melt composition in the ingot was adjusted by charging Al through an air lock. After cooling and cutting, the 10 ´ 50 ´ 130 mm3 sized blocks were hot rolled at 1100 °C into 2±0.1 mm thick and ~ 500 mm long sheets. These were reheated to 1100 °C, water quenched and cut perpendicular to the rolling direction into set of 9 segments with dimensions 2 ´ 60 ´ 55 mm3 for each alloy composition. Homogenisation was performed at 1100 °C for 2 h under Ar, followed by water quenching. Aging was conducted in air at 450, 500, 550, and 600 °C for 0, 1 and 24 h at each temperature, followed by oil quenching. This results in a matrix of 45 different sample conditions. Scales were removed from the surfaces by low-pressure, fine grit sandblasting after the heat treatments. Samples for mechanical testing and microstructure investigation were prepared from the segments by package spark erosion. Tensile testing was conducted at room temperature with an initial strain rate of 10–3 s–1. All values plotted represent averages of 3 measurements for every materials state. 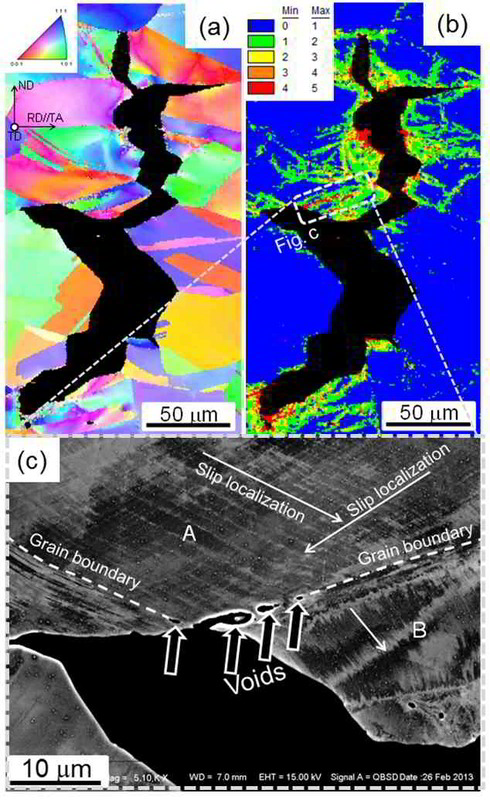 Cross sectional areas of selected samples were prepared in the plane perpendicular to the rolling direction by grinding and polishing with standard metallographic techniques. XRD analysis was performed on the rolling plane of samples ground to a thickness of 1 mm. Further details of the method are explained in . The RAP method enabled us to screen 2 different sets of five Fe–Mn–C based weight-reduced Al-containing compositions each exposed to 9 respective heat treatments within 35 hours. For each alloy base set synthesis, processing, mechanical screening, and phase characterization are included. The metallographic analysis showed no cracks, pores or macro-segregations in the final materials. The as-cast samples had a coarse dendritic microstructure. Hot rolling and water quenching resulted in a fully recrystallised microstructure with a grain size of ~20 µm with some retained micro-segregations of Mn. Fig. 3 shows the mechanical properties of 45 different material conditions obtained for the Fe–30Mn–1.2C base composition (i.e. in total 135 tensile tests and hardness measurements) in terms of the yield strength (YS, a), ultimate tensile strength (UTS, b), total elongation (TE, c) and hardness (d). The results are plotted according to the systematically varied Al content. Colour-coding reflects individual aging conditions. The data are reproduced from an earlier publication . They show a clear dependence of the mechanical behaviour on both, composition and heat treatment. For the reference material (no Al addition, i.e. ternary Fe–30Mn–1.2C alloy), the best mechanical behaviour is found for the as-homogenised state, namely, 360 MPa YS; high work hardening (830 MPa UTS); and high ductility (77 % TE). Aging of the Fe–30Mn–1.2C alloy leaves the YS virtually unchanged and increases the hardness slightly. However, it reduces UTS and TE. Embrittlement becomes most apparent for long aging times (24 h) and higher temperatures (> 500 °C). For the alloy Fe–30Mn–1.2C–8Al, i.e. the material with the highest Al content and lowest density, the opposite trend applies. Without aging, the mechanical response is similar to that of the Al-free alloy. Only a minor change in YS (increase), UTS and TE (decrease) is found. Aging for 1 h leads to an increase in YS, UTS and hardness (increasing with temperature) and only to a minor reduction in TE. Aging of the alloy Fe–30Mn–1.2C–8Al for 24 h further increases YS, UTS and hardness to levels twice as high as in the as-homogenised state, but also drastically reduces ductility. The mechanical data for the alloys with intermediate Al contents fall between the two different behaviours described above, i.e. alloys with 2-6 wt.% Al have properties between the respective values from materials without Al and with 8 wt.% Al. Especially the alloys with Al additions of 4 and 6 wt.% are only very weakly affected by the applied aging treatments in terms of their mechanical data compared to the alloys Fe–30Mn–1.2C (weakening/embrittlement) and Fe–30Mn–1.2C–8Al (strengthening). 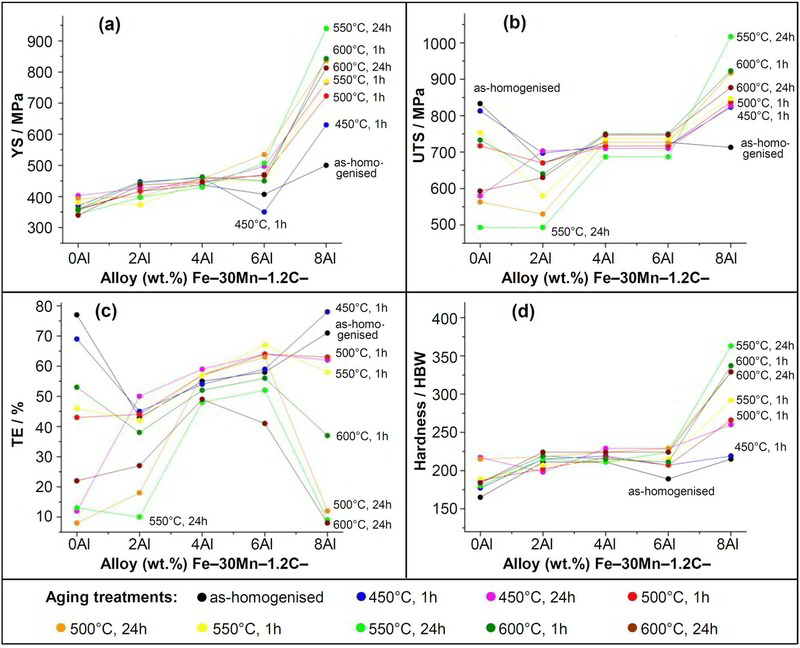 In order to better extract the mechanical trends for the investigated compositions and heat treatments, selected results are summarized in Fig. 4. By using the RAP approach we find for the 30 wt.% Mn system that high amounts of Al (~ 8 wt.%) result in pronounced strengthening during aging, depending on time and temperature, Fig. 4. The observed effects are attributed to the formation of nm-sized κ-carbides during aging. The intermediate alloy variants with Al concentrations of 2 – 6 wt.% do not show equivalent mechanical properties compared to the ~ 8 wt.% Al variant. Also, a much smaller influence of aging on the tensile behaviour can be observed in the 2 – 6 wt.% Al cases. A detailed and systematic screening of the stoichiometry, interface structure, lattice misfit, and mechanical effects of the nm-sized κ-carbides is still pending but first results suggest that they can occur in a wide compositional existence range, Fig. 5. Also it is observed that they are thermally very stable at 600°C and even prevail after 100 h heat treatment with only modest coarsening, Fig. 5. 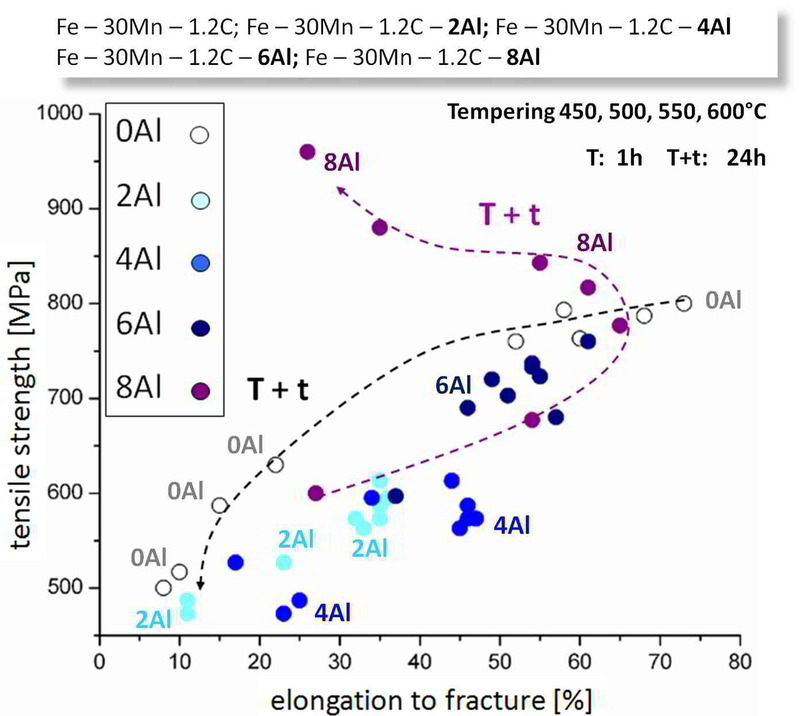 For the second alloy class investigated, namely, the Fe–20Mn–0.4C–xAl TWIP steels, a more homogeneous trend of the mechanical properties as a function of the Al content is observed, Fig. 6. While yield strength and ultimate tensile strength both increase, the tensile elongation drops as a function of the Al content in the range between 2 and 11 wt.% Al. As observed by XRD screening of the corresponding samples, the increasing ferrite content seems to be more relevant for this trend than the presence of κ carbides or e-martensite. When deriving microstructure-property relationships for austenitic low-density steels two scenarios must be considered: For compositions with 25-30 wt.% Mn and up to 4-5 wt.% Al or even 8.wt% Al, when naturally aged, the TWIP effect prevails as deformation mechanism [41,48]. Thus, dislocation based strain hardening which is followed at higher loads by mechanical twinning is the primary strain hardening mechanism. 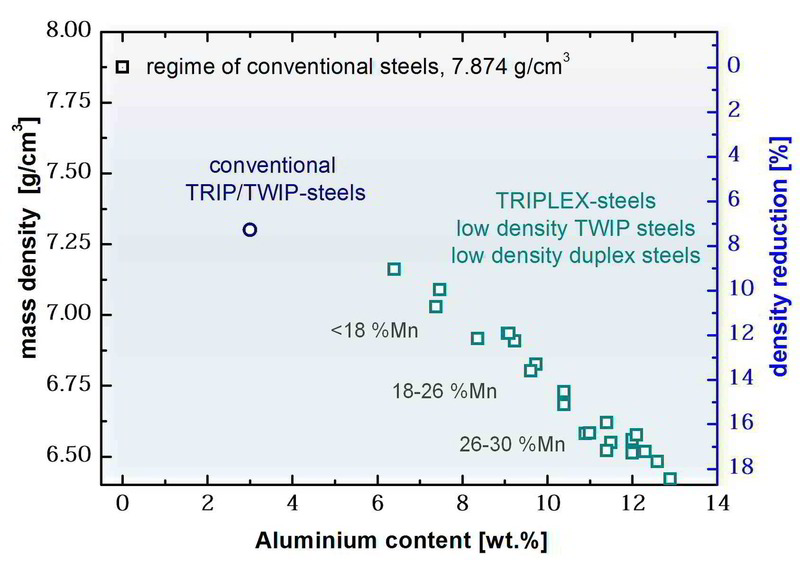 Such low-density TWIP alloys are referred to as SIMPLEX steels . After ageing at 500-600ºC or for alloys with higher Al content, twinning is reduced and strain hardening is essentially associated to κ-carbide and solid solution strengthening, Figs. 5,6. If the Al content exceeds 10 wt.%, κ-carbides can form already during quenching. The exact strain hardening mechanism for the latter case is still under investigation. In a recent study, Gutierrez-Urrutia and Raabe  suggested that the prevalent deformation mechanisms in austenitic steels that are strengthened by regularly arranged nanosized k-carbides, such as those shown in Fig. 5, consist in Orowan bypassing of longitudinal rods of k-carbides and subsequent expansion of dislocation loops, which is assisted by dislocation cross-slip and, to a minor extent, shearing of k-carbides. They further suggest that the higher dislocation densities observed within the dislocation bundles are due to minor topological differences in the spacing between the k-carbide rods, so that dislocations follow preferential soft paths within the widest channels. In certain cases these dislocation accumulations can lead to stress values that are high enough to shear k-carbide interfaces. Although these complex nanoscale interactions are still subject to further analysis we give below some suggestions how to incorporate such effects into a mean field dislocation density based model of strain hardening of k-carbide containing Fe-Mn-Al-C steels. A general form of a temperature-sensitive constitutive model for fcc metals with low stacking fault energy and mechanical twinning, depending on chemical composition, deformation rate and temperature, was introduced by Steinmetz et al. . It extends the three-internal-variable model of Roters et al. with a physical description of twin nucleation. 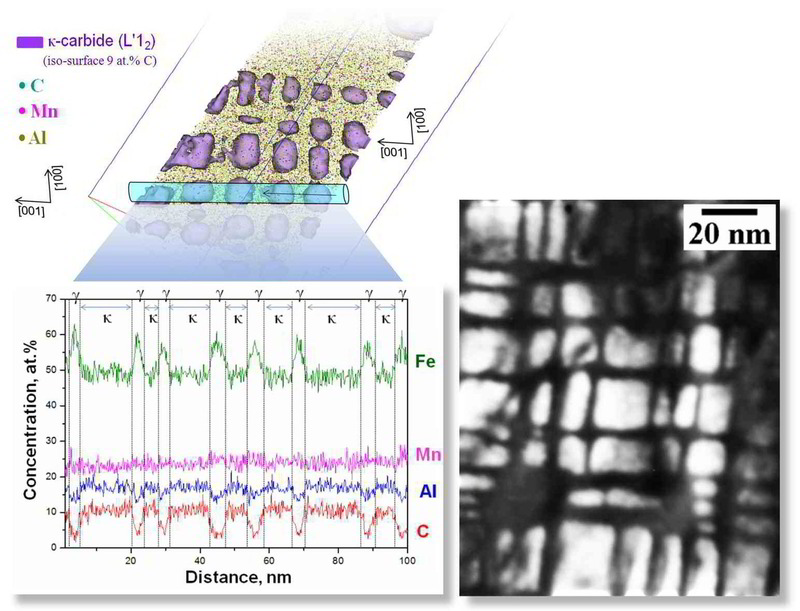 The model is based upon experimental observations performed on Fe-Mn-C TWIP steels (without k-carbides) by electron channeling contrast imaging, TEM, and EBSD (electron backscatter diffraction) [19-34]. These works revealed that the important microstructural internal state variables in such alloys include dislocations, grain size, mechanical twins, and dislocation cells. In this regard, this model provides a quantitative description of strain hardening behaviour of low-density TWIP steels, i.e. SIMPLEX steels. Following the comments made above, strain hardening in κ-carbide containing steels can be described in a seamless fashion where the activation barrier for twinning can vary as a function of the Al content and a carbide-rod dependent Orowan loop mechanism can be introduced in the form of a corresponding stress term in the kinetic equation of state. The latter formulation is not yet presented here. Here we provide a summarized description of the temperature-sensitive constitutive model of strain hardening for single phase low-density TWIP steels, i.e. SIMPLEX steels. The model uses three different dislocation densities ( , , ) and the volume fraction of mechanical twins ( ) as state variables. The three dislocation densities are those in the cell interior, in the cell walls, and dipoles. The evolutions of these state variables represent the microstructural changes which occur during plastic deformation. 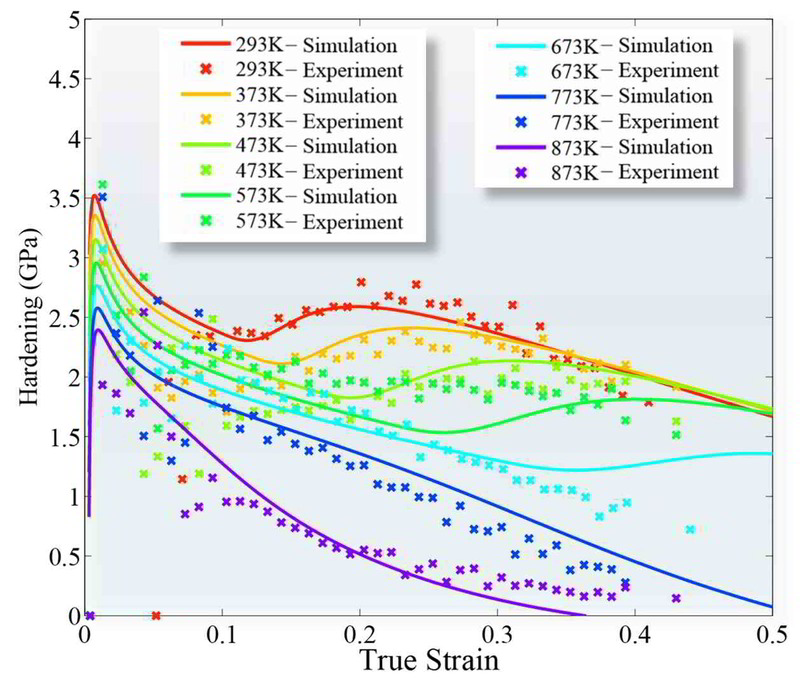 With a general form of a fcc strain hardening model for alloys with low SFE, experimental results over a wide range of temperatures can be realistically simulated using a single parameter set. Here we provide evidence of the robustness of the model by illustrating both experimental and simulated flow curves of a Fe-22wt.%Mn-0.6wt.%C TWIP model alloy at different deformation conditions (data taken from ). Fig. 7a shows the flow curves for a set of 7 different temperatures and Fig. 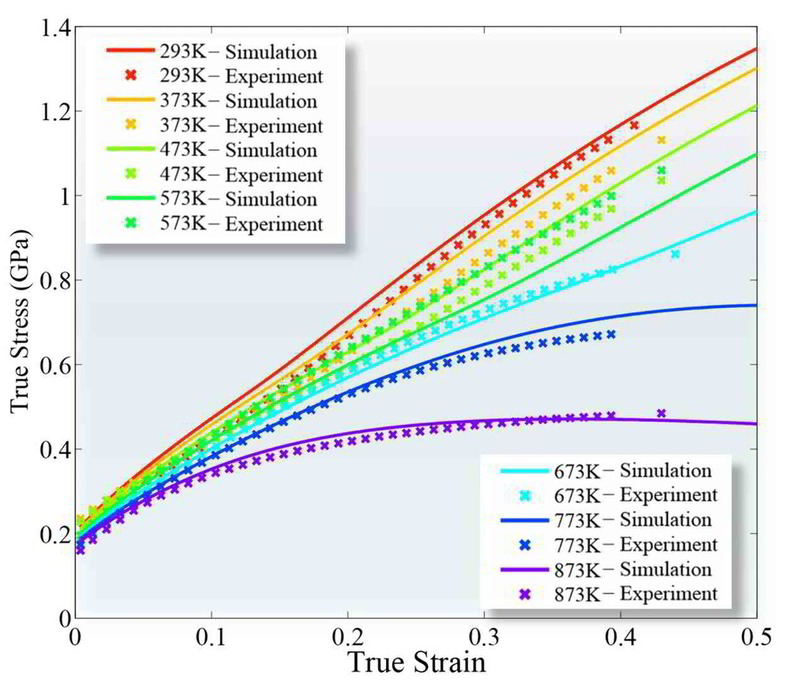 7b shows the strain hardening curves corresponding to the stress-strain curves in Fig. 7a. 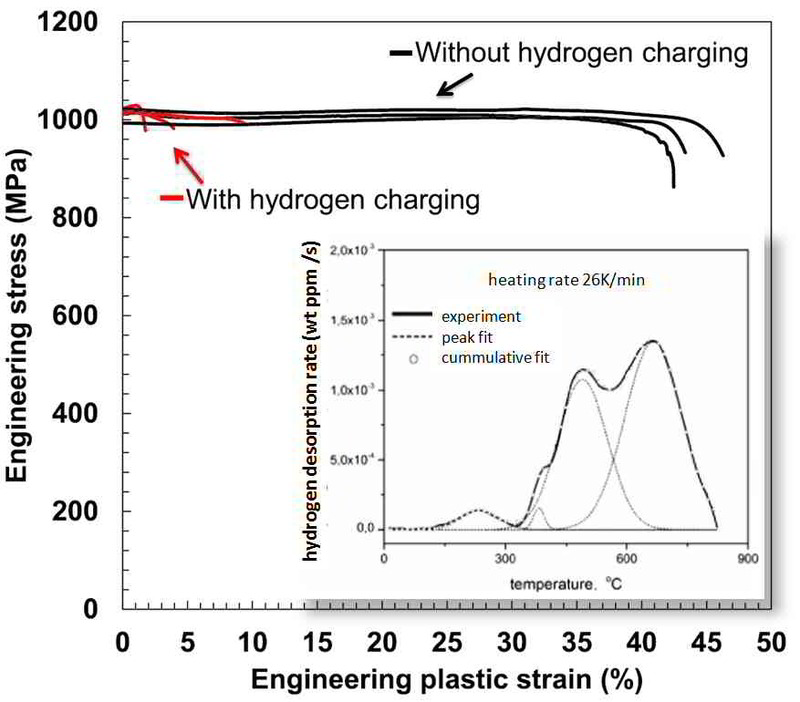 Like for other steels approaching or exceeding 1 GPa in tensile strength, hydrogen embrittlement becomes an essential challenge also for TWIP grades [44-58]. Corresponding hydrogen-assisted fracture effects in a low density austenitic steel were recently studied by our group . More specific, the influence of hydrogen on the tensile ductility of a κ-carbide hardened austenitic low-density steel with composition Fe-26Mn-11Al-1.2C (wt.%) was studied under direct, i.e. permanent hydrogen charging. The hydrogen-induced micro-mechanisms pertaining to crack formation and crack propagation were studied by employing a joint probing approach using EBSD in conjunction with electron channeling contrast imaging (ECCI) [30-34]. The observed embrittlement effects in this alloy were mainly due to two distinct phenomena. The first damage initiation mechanism was characterized by cracking at grain boundary triple junctions. The second mechanism was characterized by the gradual formation of chains of micro-voids that formed on grain boundaries under the influence of pronounced planar slip-localization, Fig. 8 . This effect entailed void coalescence and intergranular cracking along the grain boundaries affected. It was suggested that specifically the latter mechanism, i.e. intense slip localization, was linked to the presence of κ-carbides in this steel. By using thermal desorption analysis, Koyama et al. observed that the κ-carbides can act as a hydrogen trap sites with an estimated activation energy of ~76-80 kJ/mol as obtained from a corresponding Redlich-Kister analysis, Fig. 9. Thus, while κ-carbide precipitates could on the one hand act as beneficial trapping sites that might render hydrogen immobile, the associated hydrogen-assisted planar slip acts on the other hand in the opposite direction by promoting grain boundary void formation. We presented an approach for the metallurgical bulk-scale high throughput synthesis and processing of low-density austenitic steels. As model system we have chosen Fe-Mn-Al-C steels which exhibit a wide spectrum of characteristics. In order to reduce the density of such materials the focus was placed on the effect of variations in the Al concentrations in the range between 0 wt.% and 11 wt.%. For weight measurements some alloys with up to 13 wt.% Al were synthesized, revealing a reduction in density by about 18%. 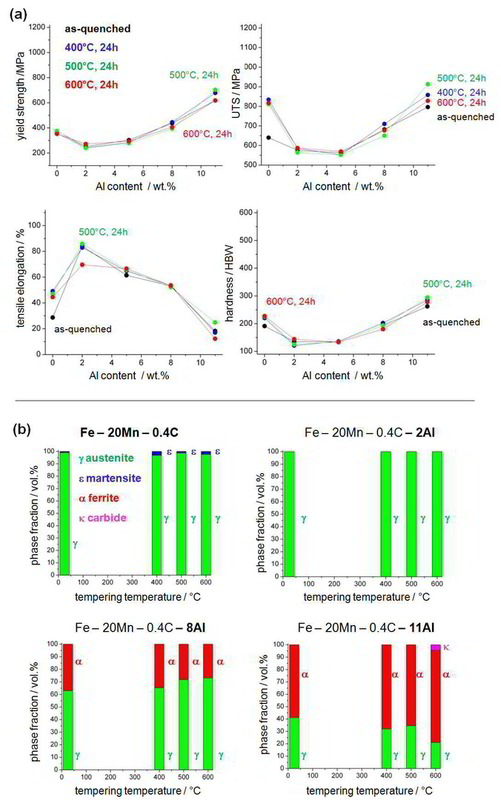 Additionally, two different Fe-Mn-C base compositions were screened, namely one with 20 wt.% Mn and 0.4 wt.% C and the other one with 30 wt.% Mn and 1.2 wt.% C. This relatively large set of material data showed that increasing the Al content promotes the formation of κ-carbides and ferrite. In case that a single phase austenite matrix is desired the ferrite stabilizing effect of Al must be compensated by an increased Mn and C content. The latter balance is also of very high relevance for optimizing the stacking fault energy which controls the TWIP effect. Two types of austenitic Fe-Mn-Al-C steels were addressed in more detail. The first one is a type of low-density TWIP (or SIMPLEX) steel with 25-30 wt.% Mn and <4-5 wt.% Al. The second one is a class of κ-carbide strengthened steel with the same chemical composition than the SIMPLEX steel and aged at 500-600ºC or with higher Al content (above 10 wt%). In the latter case, κ-carbides were observed to form during quenching. The strain hardening characteristics of low-density austenitic steels were discussed in terms of a structure-property constitutive model. The high strain hardening capability of the low-density TWIP steel results from the onset of mechanical twinning at rather high stress levels. Therefore, it is important in corresponding alloy design strategies for low density TWIP steels to consider a relatively high content in both, Mn and C. Otherwise the stacking fault energy becomes too high and twinning might become ineffective or suppressed. The role of κ-carbides on the strain hardening behavior of the non-TWIP variants was discussed in terms of Orowan bypassing of elongated rods of such carbides. Further strain hardening effects associated with κ-carbides are still subject to further work owing to our still limited knowledge about the interaction between dislocations, twins, and κ-carbides. Likewise, the role and also the alloying limits of a further increased C content and its effect on decoration, localization, nonlinear effects, and cross slip of dislocations is not yet clear and requires further research. J.G. Speer, D.K. Matlock, B.C. De Cooman, J.G. Schroth, Acta Mater 51,2611 (2003). D. Barbier, N. Gey, S. Allain, N. Bozzolo, M. Humbert, Mater Sci Eng A 500,196 (2009). F.G. Caballero, H.K.D.H. Bhadeshia. Curr. Opin. Solid State Mater. Sci. 8,251 (2004). M. Calcagnotto, Y. Adachi, D. Ponge, D. Raabe, Acta Mater. 59,658 (2011). R. Song, D. Ponge, D. Raabe, J.G. Speer, D.K. Matlock, Mater. Sc. Engin. A 441, 1 (2006). B.C. De Cooman, O. Kwon, K.G. Chin. J. Mater. Sci. Techn.28,513 (2012). M. Calcagnotto, D. Ponge, D. Raabe, ISIJ Intern. 48,1096 (2008). R. Song, D. Ponge, D. Raabe, Acta Mater. 53,4881(2005). Y. Sakuma, Matsumura O, Akisue O. ISIJ Int 31,1348 (1991). B.C. De Cooman, J.G. Speer, Steel Res. Int. 77,634 (2006). Y. Toji, H. Matsuda, M. Herbig, P.-P. Choi, D. Raabe, Acta Mater. 65, 215 (2014). F.G. Caballero, H.K.D.H. Bhadeshia, J.A. Mawella, D.G. Jones, P. Brown, Mater. Sci. Technol. 17,517 (2001). D. Raabe, S. Sandlöbes, J. Millán, D. Ponge, H. Assadi, M. Herbig, P.P. Choi, Acta Mater 61, 6132 (2013). D. Raabe, D. Ponge, O. Dmitrieva, B. Sander, Scripta Mater 60,1141 (2009). L. Yuan, D. Ponge, J. Wittig, P.P. Choi, J.A. Jiminez, D. Raabe, Acta Mater 60,2790 (2012). O. Grässel, L. Krüger, G. Frommeyer, L.W. Meyer, Int. J. Plast. 16,1391 (2000). G. Frommeyer, U. Brüx, P. Neumann, ISIJ Int. 43, 438 (2003). G. Frommeyer, U. Brüx, Steel Res. Int. 77, 627 (2006). O. Bouaziz, S. Allain, C.P. Scott, P. Cugy, D. Barbier. Curr. Opin. Solid State Mater. Sci. 15,141 (2011). A. Saeed-Akbari, L. Mosecker, A. Schwedt, W. Bleck. Metall Mater Trans A 43, 1688 (2012). J.E. Jin, Y.K. Lee, Mater. Sci. Eng. A 527,157 (2009). J.K. Kim, L. Chen, H.S. Kim, S.K. Kim, Y. Estrin, B.C. Cooman. Metall Mater Trans A 40,3147 (2009). S. Curtze, V.T. Kuokkala, Acta Mater 58,5129 (2010). I. Gutierrez-Urrutia, S. Zaefferer, D. Raabe. Mater. Sci. Eng. A 527,3552 (2010). H. Idrissi, K. Renard, D. Schryvers, P.J. Jacques. Scripta Mater 63,961 (2010). O. Bouaziz, S. Allain, C. Scott, Scripta Mater., 58, 484 (2008). H. Beladi, I. B. Timokhina, Y. Estrin, J. Kim, B. C. Cooman, S. K. Kim, Acta Mater., 59, 7787 (2011). H. K. Yang, Z. J. Zhang, and Z. F. Zhang, Scripta Mater., 2013, 68, 992–995. D. Barbier, N. Gey, S. Allain, N. Bozzolo, and M. Humbert, Mater. Sci. Eng. A, 2009, 500, 196-206. I. Gutierrez-Urrutia, S. Zaefferer, and D. Raabe, JOM, 2013, 65, 1229-1236. I. Gutierrez-Urrutia, S. Zaefferer, and D. Raabe, Scripta Mater., 2009, 61, 737­740. I. Gutierrez-Urrutia and D. Raabe, Scripta Mater., 2012, 66, 992-996. I. Gutierrez-Urrutia and D. Raabe, Acta Mater., 2011, 59, 6449-6462. I. Gutierrez-Urrutia and D. Raabe, Scripta Mater., 2012, 66, 343-346. S. Reeh, D. Music, T. Gebhardt, M. Kasprzak, T. Jäpel, S. Zaefferer, D. Raabe, S. Richter, A. Schwedt, J. Mayer, B. Wietbrock, G. Hirt, J.M. Schneider, Acta Mater. 60 6025 (2012). H. Kim, D.-W. Suh, N. J. Kim, Sci. Technol. Adv. Mater. 14, 014205 (2013). G. Frommeyer, U. Brüx, Steel Res. Int., 77, 627 (2006). J. D. Yoo, K.-T. Park, Mater. Sci. Eng. A, 496, 417 (2008). K. M. Chang, C. G. Chao, T. F. Liu, Scripta Mater., 63, 162 (2010). K. Choi, C.-H. Seo, H. Lee, S. K. Kim, J. H. Kwak, K. G. Chin, K.-T. Park, J. Kim, Scripta Mater., 63, 1028 (2010). I. Gutierrez-Urrutia, D. Raabe, Acta Mater., 60, 5791 (2012). S. Y. Han, S. Y. Shin, H.-J. Lee, B.-J. Lee, S. Lee, N. J. Kim, J.-H. Kwak, Metall. Mater. Trans. A, 43A, 843 (2012). I. Gutierrez-Urrutia, D. Raabe, Scripta Mater., 68, 343 (2013). Y. Kimura, K. Handa, H. Hayashi, Y. Mishima, Intermetallics, 12, 607 (2004). J.-B. Seol, D. Raabe, P. Choi, H.-S. Park, J.-H. Kwak, C.-G. Park, Scripta Mater., 68, 348 (2013). C. Y. Chao, C. N. Hwang, T. F. Liu, Scripta Metall. Mater., 28, 109 (1993). C. N. Hwang, C. Y. Chao, T. F. Liu, Scripta Metall. Mater., 28, 263­ (1993). I. Gutierrez-Urrutia, D. Raabe, Mater. Sc. Technol., in press (2014). H. Springer, D. Raabe, Acta Mater. 60 , 4950 (2012). D.R. Steinmetz, T. Japel, B. Wietbrock, P. Eisenlohr, I. Gutierrez-Urrutia, A. Saeed-Akbari, T. Hickel, F. Roters, D. Raabe, Acta Mater 61, 494 (2013). F. Roters, D. Raabe, G. Gottstein, Acta Mater. 48, 4181 (2000). H. Mecking, U.F. Kocks, Acta Metallur. 29, 1865 (1981). U.F. Kocks, A.S. Argon, M.F. Ashby, Progr. Mater.Science, 19, 1 (1975). R.L. Fullman, Trans AIME. 197, 447 (1953). S. Mahajan, G.Y. Chin, Acta Metall., 21, 1353 (1973). A. Saeed-Akbari, J. Imlau, U. Prahl, W. Bleck, Met. Mat. Trans. A, 40A, 3076 (2009). M. Koyama, E. Akiyama, T. Sawaguchi, D. Raabe, K. Tsuzaki, Scripta Mater., 66, 459 (2012). M. Koyama, E. Akiyama, K. Tsuzaki, D. Raabe, Acta Mater. 61, 4607 (2013). M. Koyama, H. Springer, S. V. Merzlikin, K. Tsuzaki, E. Akiyama, D. Raabe, Intern. J. Hydrogen Energy 39, 4634 (2014).